This year’s report aims to shine a light on those who gave towards LAU during Fiscal Year 2018, which spanned from September 1, 2017, to August 31, 2018. The annual GCI Middle School Model UN conference forges a robust engagement and empowerment of today’s youth. Hiba Yazbeck and Dr. Myrna Doumit continue to build hope for women all over Lebanon. Arab ensemble performs a long-lost masterpiece of Syrian music at LAU NY. LAU NY hosts a panel on the revolutionary intellectual. President Jabbra briefs faculty and staff on the Board of Trustees meeting. The fifth-year pharmacy major is now off to compete in Miss Universe. For the first time, LAU features in the Times Higher Education ranking, and prominently in the QS Employability rankings. The newest cohort of MEPI TL scholars starts the next chapter of their lives. CLH and LAU NY celebrate the centennial of Gibran’s masterpiece, The Madman. IWSAW director named one of the world’s most influential people in gender policy. LAU leads Model UN Conference for high-school students to help instill leadership and diplomatic skills in future generations. During LAU’s GCI High School Model UN Conference, WNYC Radio spoke with some of the student delegates, on one very specific global issue: the status of women and girls. More than 150 benefactors attended LAU New York’s gala dinner to celebrate and support the Institute for Women’s Studies in the Arab World. LAU hosts world’s largest Model UN Conference for Middle Schoolers in New York. Syrian child refugees in Lebanon are using hand-written letters and drawings to bridge the vast gap between their experiences and the lives of other children in New York. Hundreds of LAU runners and volunteers join the Beirut Marathon in support of the country’s unity and the community’s welfare. LAU alumna together with faculty member at the Alice Ramez Chagoury School of Nursing campaign against breast cancer and the stigma attached to it with the C2 campaign. The 2017 GOLD conference focuses on youth engagement in support of sustainable development goals to tackle the global youth employment crisis. LAU’s New York Academic Center and the Consul General of Lebanon Majdi Ramadan recently hosted a first-of-its-kind evening dedicated to celebrating Lebanese olive oil. 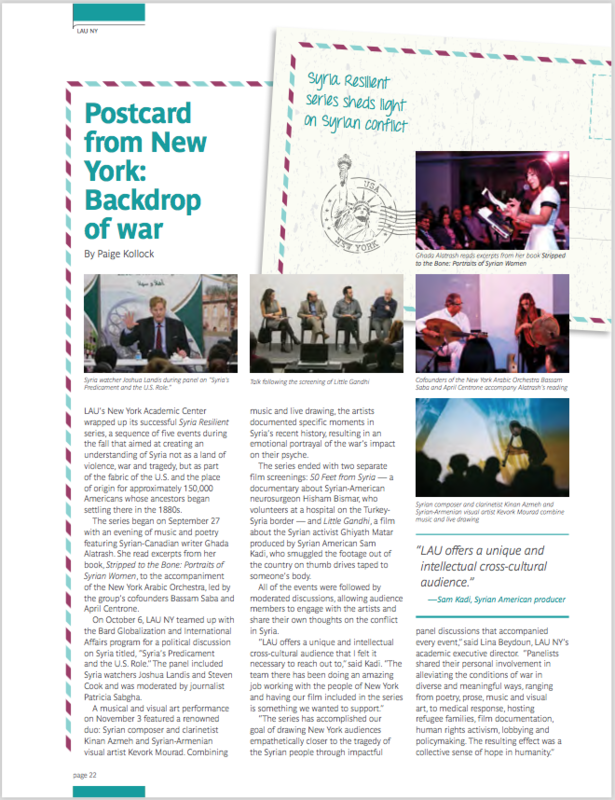 LAU’s New York Academic Center wrapped up its successful Syria Resilient series, a sequence of five events during the fall that aimed at creating an understanding of Syria. LAU alumnus and television celebrity Zaven Kouyoumdjian brings his latest book, Lebanon On Screen: The Greatest Moments of Lebanese Television and Pop Culture, to LAU NY. Journalist Amir Bibawy interviews Captain Beale and one of his crew members, Remi Kahwaji, at LAU NY, about the Phoenician Expedition that they will be embarking on in September. A screening of “Little Gandhi,” a documentary about the Syrian peace activist Ghiyath Matar, at the Lebanese American University in Midtown Manhattan. The Arab American National Museum celebrated recipients of the 10th annual Arab American Book Awards in a ceremony at LAU’s New York Academic Center. The evening commemorated Lebanese poet Jawdat R. Haydar, offering a glimpse of his legacy through a documentary film, readings, and an exhibit featuring artifacts from his life. With the implosion of Syria’s social fabric and near total collapse of its institutions, many question the country’s ability to remain resilient, and its people hopeful. The Lebanese Diaspora has become the source of critical revenues, through remittances and investments, while providing knowledge, investment, trade, and global business connections. On a cultural and academic level, the Lebanese American University New York Academic Center has proved its worth. On July 27, the Academic Center welcomed Lebanese author Raif Shwayri for a discussion of his new book, Beirut on the Bayou: Alfred Nicola, Louisiana, and the Making of Modern Lebanon, led by New York-based author and scholar Linda K. Jacobs. A mainstay in Lebanon for more than five decades, the respected Al-Kafaat Foundation stems from the success of Habib Shwayri, who emigrated to the United States, settled in Louisiana and defied the odds to build a clothing empire and make a fortune. For Lebanese-Americans the food of their ancestors has always been key to preserving their identity and perpetuating a culture that celebrates life and its joys. Many universities in the United States and Europe are falling over themselves to expand their presence in the Middle East. What was meant to be a conversation on immigration and identity through the prism of food was rapidly ground down into an enjoyable dialogue on hummus, the dish that, it appeared, was the uber-embodiment of Lebanese fare. With his love for dance and choreography, he took the public elsewhere. His elsewhere was Assyrian, Syriac, and Bedouin folkloric. Welcome to the multicultural world of Fadi J. Khoury. “Dance is the hidden language of the soul,” American modern dancer and choreographer Martha Graham once said. Lina Beydoun, academic executive director of the LAU New York Academic Center, joined prominent practitioners, thought leaders, academics and entrepreneurs at the Wharton School of Business. The corridors of LAU NY reverberated with the sweet and sultry sounds of traditional Arabic music on March 11 when the Academic Center welcomed the New York Arabic Orchestra. The New York Arabic Orchestra resumed its musical programs under its new non-profit status. LAU, in partnership with AUC, hosted a panel discussion on the expansion of U.S. universities abroad and American-style education in the Middle East. LAU students learned about these pitfalls and others in a course called International Service Management, held at LAU NY in January. Over 150 people attended a lecture on the evolution of the Lebanese wine industry recently held at LAU NY. Radio Sawa correspondent Amir Bibaway speaks to Dr. Samira Aghacy, professor of English and Comparative Literature at the Lebanese American University about her book, Writing Beirut. Samira Aghacy, LAU professor of English and comparative literature, visited LAU NY to launch her book, Writing Beirut: Mappings of the City in the Modern Arabic Novel. For many of LAU’s business school graduates, there are but two viable options: stay and work in Lebanon, or go to the Gulf. Drawing on historical, geographical, archaeological, cultural and theological sources, el Koussa re-examined the validity of typically dismissed apocryphal gospels, such as the Gospel of Bartholomew and the Gospel of James. Lebanese American University is the first Arab university to open a branch in the United States. This video takes a look at the history of the university and its recent activities in New York. Fifty years ago this week, U.S. astronaut Edward White became the first American to walk in space. Will space travel become more and more accessible to the general public? “Winning the war on terror means shattering stereotypes,” said Dr. Jack Shaheen on the opening night of “The Arab-American Experience,” a series of events aimed at dispelling stereotypes. The event combined a workshop format with a panel discussion during which nine experts deliberated on how the diaspora can contribute more effectively to Lebanon’s economic development. Organized by Lina Beydoun, Academic Director at LAU NY, and Majdi Ramadan, Consul General of Lebanon in New York, this event on the diaspora’s economic engagement was a real success. With a population of more than eight million, New York City faces a constant challenge when it comes to crowd control. Twenty-seven LAU MBA and EMBA students crossed the Atlantic for a 10-day trip for a Global Marketing and Finance course. Dr. Mimi Jeha talks about Arabic language courses offered in both New York and Lebanon. Dr. Lina Beydoun speaks about the vision of the Center. Drs. Yassine-Hamdan and Pearson speak about their book, Arab Approaches to Conflict Resolution, during their talk at LAU NY Academic Center. The Academic Center hosts lectures on Arab approaches to conflict resolution and Lebanon’s World Heritage Sites.